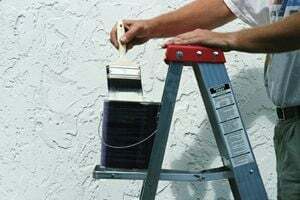 Painting your home, either the interior or the exterior, is the perfect example of a home improvement project that you probably could do on your own, but don't necessarily want to. By the time you move all your furniture, tape the edges, electrical outlets, buy the supplies, stir the paint, do the job, and then clean up, you'll be more than fed up. If you have some expendable cash, hiring a professional painter can make a lot of sense. Just because you can do something on your own doesn't make it the best answer. Don't play the hero, either. Between moving pieces of heavy furniture around and the repetitive motion of rolling paint, even physically fit homeowners can experience an aching back by the time the job's done. Besides convenience, the other reason to hire a professional Austin home painter is they are, in fact, professionals. They paint for a living and have good eyes and steady hands to create smooth edges and consistent paint coverage. You pick the color, and the painters will make it look sharp. Many professional painting companies also offer specialty painting services. Faux finishing and textured painting techniques can create absolutely stunning walls that many homeowners could never achieve on their own and will garner the admiration of many a house guest. Expect it to take a week or two to choose which Austin home painter you want to hire and a day or two at most for your contractor to finish the job. If you get unlucky and bad weather hits, it may take a little extra time to paint your home's exterior. Even if it doesn't rain on the exact day, a spell of bad weather can set the professional painter behind on his or her schedule. There's little that can be done about this, but the painter should naturally let you know that your project will be delayed if this happens. First, make sure you're comparing the same work for different bids. One estimate may appear cheaper but doesn't include touch-ups, the same level of post-job clean up, or even the same quality paint. Make sure you're comparing apples-to-apples before you make a decision. It sounds obvious, but choose your colors carefully. Professional painters rarely double as interior decorators. Most people find choosing the color palette of their home the most fun part of a painting job, so have fun with it and get it right. Finally, clearly communicate with the painting contractor what you expect. If you have pets, children, a fragile family heirloom that can't be replaced, anything particular about your home, let the painters know. If you feel comfortable, offer them the use of your bathroom, water, lemonade, or another refreshing beverage. Ask the person who gives the estimate if they'll also be at your home during the painting. If you need at least one of the painters to speak English fluidly, convey this before the day of the job. Comment: Interior of 2 bdrm, 1 1/2 bath kitchen/dining room. Include painting interior of all cabinets in kitchen, dining room, bathrooms. Paint all trim: baseboards, stair rail, all cabinets. Comment: I would like the exterior wood portion of my home painted, and am also interested in having the fascia replaced. Comment: I have a new deck and stairs that I want primed. I have 5 gallons of Kilz latex outdoor primer. I need caulking of the structure before priming. It may need 2 coats of primer. I do not know the final paint color yet. I will make those determinations after the primer is applied. I am looking for a bid, or an hourly rate. I will supply all necessary materials. Only your professional labor is required. Austin Painting Contractors are rated 4.80 out of 5 based on 2,224 reviews of 157 pros. Not Looking for Painting Contractors in Austin, TX?